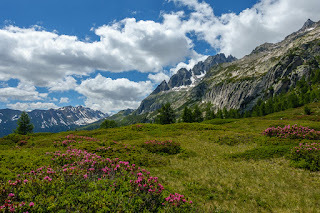 We took a long weekend to spend some time at the Capanna Piansecco, one of those "we really should visit" places that's just too far away for us to do for a normal weekend - the last time we were in this area was 2010! On Saturday we take the trains to Airolo and then the bus up to All'Acqua (same starting point as last time, though then we went the other way and had heavier packs!). It's only about an hour along a nice trail to get up, up, up to the hut. Once there we drop off a bunch of stuff we won't need and then head out to the climbing area East of the hut. We manage to misread the sketch on the topo and end up in a lovely field that's way past the crag itself, but that's a fantastic place to have lunch and a nap. So we do that. The views, including the ridge of the Poncione di Cassina Baggio (a possible tour destination) are really very good. After the break we head back towards the hut and manage to find our way to the crag on the way. 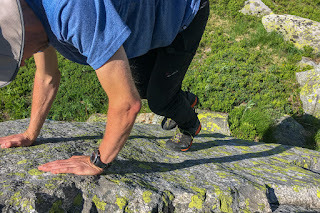 We do a few routes to get used to (and enjoy) the granite, including a couple of really good slabby stretches. mmm, slab climbing on grippy granite! :-) Back at the hut we get checked in, have cake and cool beverages, and generally rest and enjoy the views until it's time for dinner (which is excellent). Amusing meeting of someone g knows from chemistry meetings who has just moved to Basel and is on a tour with a group of colleagues. After a pretty good night's sleep (a big group didn't show up, so the room we're in is only half full) we get up a bit early, have a so so breakfast (we are in Ticino), and are underway just after 7:00. The plan is to do the ridge of the Poncione di Cassina Baggio, which seems like it'll just be awesome. The tour will be reasonably long and we aren't completely sure what the conditions on the descent will be. There's perhaps a bit more snow around than we would like and we aren't wearing the best shoes for that, but the worse is that we don't have ice axes with us (this was a dumb decision on our part, and one we shouldn't make again). We have looked at the route up to the beginning of the climbing from the hut (there's an obvious trail that leads to the Chuebodenhorn), but we didn't actually scout it out the day before (another silly mistake). This oversight leads us to follow the wrong use trail away from the hut. We know we aren't heading directly towards the piece of trail that's visible, but we figure that as we ascend we'll hit something that leads us across to it. This turns out not to be the case, so we eventually go cross country and steeply descend to the trail itself. This little adventure has cost us about 30 minutes. Given that it's likely to be a long day, that there are a number of questions hanging over the tour already, and that we've just gotten off to a stupid start, we decide not to do the ridge. We could still do the first tower and abseil down from that, but after heading up a bit higher we can see that couloir we'd abseil into is still full of snow, so that's out. Ah well, the Chuebodenhorn is towering above us and should be doable, so we change our plans. 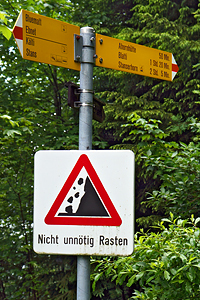 We ditch the climbing gear at the old bivac and then head up, up, up, to the Gerenpass. This is a steep mixture of loose moraine and snow, but the going is still reasonably good. At the pass we enjoy the views, including the teeny but very cool Chuebodengletscher, have a snack, and then head up towards the Chuebodenhorn. This isn't a marked trail, but there are cairns about that we can follow. Following the description we have of the hike and in order to avoid a couple of patches of steep snow, we head across to the ridge and head up that. This is fun talus hopping and very reminiscent of the climb up to Mt. Julius Caesar. The views are just stunning. Looking towards the Berner Oberland on the way up to the Chuebodenhorn. 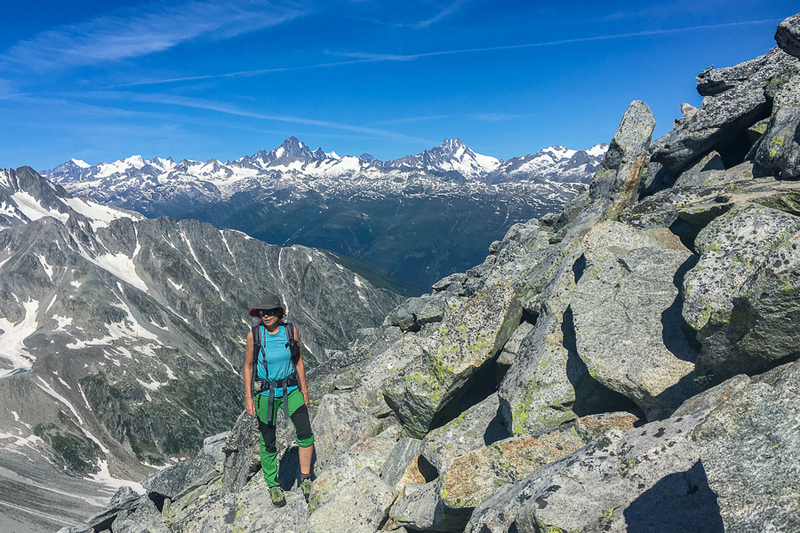 We pass a couple of people coming down and end up having the peak to ourselves, so we have enjoy a nice long break to have lunch, rest, and enjoy the amazing, amazing views. 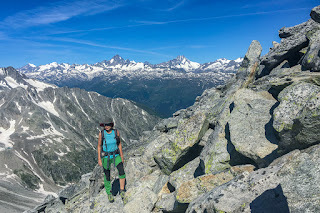 We can see a large part of the Swiss Alps from here: running from Mont Blanc, to some of the Walliser 4000ers, the Berner Oberland, and on to the Bernina group. Yowza! After a good rest we head back down to the pass. Since we've got a better overview of what's coming, we just follow the cairns down. The rest of the descent to the hut is the same way we came up (except the stupid detour, of course). Back at the hut we have a cool beverage and a break before heading down to the river to lounge around in the shade for a bit (it's hot!). After a bit of that we explore the various boulders laying around on the plain and do a bit of playing around on them. Back at the hut we enjoy another good meal and then head off to bed. We opt to spend the first part of Monday climbing on the crag to the West of the hut. This is more fun on slabby granite and we even get in a short multi-pitch route before g's brain starts to get sun-baked and tired and we stop for the day. After a leisurely lunch break back at the hut we pack up our stuff and head back down to All'Acqua to start the long trip home. We'll have to head back to Cap. Piansecco at some point and actually do that ridge!